BERLIN - The Turkish foreign minister has praised Thursday Turkish efforts towards the Kurdish community. In an interview to German newspaper "Die Zeit," Mevlut Cavusoglu drew attention to support provided to the Kurdish peshmerga forces as well as the solution process for Kurds in Turkey. "The rights that have been given to Kurds for 10 years could not be even dreamed (before)," said Cavusoglu. The Turkish government has launched what is called a solution process in 2013 to end the decades-old conflict with the outlawed Kurdistan Workers’ Party, in the country's eastern and southeastern regions. 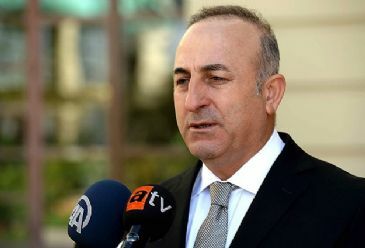 Cavusoglu also said that the Kurds could not be mixed up with members of the Kurdistan Workers' Party, or PKK, which is listed as a terrorist group by Turkey, the U.S. and the European Union. "PKK is a (…) terrorist organization but Kurds are not terrorists," said Cavusoglu. The Turkish foreign minister also mentioned the support given to peshmerga forces. "We are the most important supporter of Kurdish peshmerga who fight against (the Islamic State of Iraq and the Levant)," he said. Turkey allowed Kurdish peshmerga forces from northern Iraq to enter Kobani through its borders in October. "We are providing equipment to Kurdish peshmerga and we train them," added the Turkish foreign minister. Iraqi peshmerga forces, as well as other Kurdish fighters, the Free Syrian army, and the U.S.-led international coalition have all been battling the Islamic State of Iraq and the Levant, or ISIL, through ground and air campaigns.